The FabLab movement, established nationwide to give people back ‘The Power of Making’ with hi-tech facilities and activities, comes to Blackburn! FabLab Pembrokeshire arrive with an eight-legged, robotic creature ready to mingle with festival crowds and Ant-Weight robot-wars demonstration robots for you to activate your destructive side with. 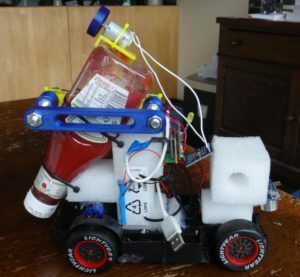 AntWeight is similar to the Robot Wars on TV… except that the robots must be no larger than 4″ cubed! Their their bouncing ball simulator simulates what happens if you drop a ball on the moon, mars or the sun! They’re joined by Fablab Warrington, who’re showing off what they’ve been working on over the last year, while adding their own fleet of 3D printers to the Making Room’s considerable collection. With more than 30,000 projects funded in the UK alone, Kickstarter has become a hub of creativity, where makers can connect with an audience and gather resources to bring their project to life. The Making Rooms welcomes Kickstarter’s Outreach Lead, Heather Corcoran, for a series of one-to-one sessions and an exclusive insight into the best way to craft a great campaign and foster a healthy Kickstarter Community. 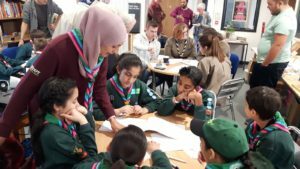 Local scout groups have been challenged by IN4.0 and UCLan to design life-changing aids and devices for those with physical disadvantages using the latest technologies. We’ll be sharing the groups’ imaginative solutions at the Festival weekend, so keep your eye out for some honourable mentions! And much, much more! Including working commissions from the Making Rooms’ resident artist, a have-a-go potter’s wheel, bronze statue making demonstrations, art from Kate Illustrates, Hellion Toys and how-tos on how to up-cycle your furniture!